If your child loves Pokemon characters, then throwing a Pokemon birthday party for him or her seems like an excellent choice. Use the following ideas to plan your special event. You can purchase Pokemon birthday invitations from a party store or make your own. If you decide to make your own, I recommend (for the sake of simplicity) that your use white blank invitation cards. Simply print a picture of your child on the front of the cards, and then decorate them with Pokemon images and stickers. As a variation, you can purchase Pokemon activity books and get the birthday child to color the pages. Then take the pages out, fold them in half, and write Pokemon birthday party details in between images. Voila! You have pretty original invitations! Print pictures of different Pokemon characters and mount them on the fence. Cut out weird-looking paw prints from brown, yellow and green construction paper. Spread them out on the driveway as if Pokemon characters were running towards your door. Place a sign near the entrance that says “Welcome to Pokemon Birthday Party!” Play theme music in the background. If you have a lawn in your yard, then decorate it with grass-type Pokemon creatures. You can spread out figurines or make your own stuffed Treecko characters. Simply cut out plenty of Treecko shapes from lime green construction paper. Put two side-by-side, fill with cotton balls, and staple them together. Then (using picture as a guide) draw eyes, paint stomach area pink, etc. Decorate the walls inside the house with Pokemon posters. Hang colorful streamers and balloons all around the area. Attach tumbling ninja characters (available at most party stores) to the furniture. Create a large sign that says “Who Wants to be a Pokemon Master?” and tape to the wall. Place several bouncy balls and baseballs (decorated as Poke Balls) underneath the sign. Cover your Pokemon birthday party table with a theme tablecloth. Place a stuffed Pokemon toy (or blowout) for a centerpiece. Put a Pokemon game trading card at each setting for the kids to take home. Tie helium balloons to the backs of the chairs. *Guess How Many: Fill a jar with jellybeans and have the kids guess how many candies are in the jar. Give the jellybeans to a child who can guess closest to the amount, and give the leftovers to other Pokemon birthday party guests. *Coloring Pages: Invite young kids to color pages of Pokemon activity books with crayons and coloring pens while they are waiting for others to arrive. *Play-Doh Activity: You can get Play-Doh and Cookie cutter activity kit from a party store. At activity time, have the kids create and decorate various fun shapes! For Pokemon party favors, include such items as Pokemon game trading cards, sticker sheets, character rings, colorful glow sticks, laser spinners, tumbling ninja characters, etc. *Pin the Tail on Pikachu: For this traditional game, use a blown-up image or poster of Pikachu. Cut tail shapes out of construction paper. (You should have enough for every child.) Write guests’ names and put double-sided tape on each tail shape. *PokéRinger Toss: For this Pokemon birthday party game, you’ll need 2 stakes or sturdy sticks, large tossing rings or rope, masking tape or string. Before the party, hammer 2 stakes into the ground a good distance apart. (Keep in mind the age of kids and their skill level when determining the distance.) If you find that the tossing rings are too heavy for your guests, you can make rings out of rope. Form rings that are about 10″ in diameter, so they’ll easily slip over the stakes. Have the kids stand behind a masking tape or string, and invite the players to take turns tossing their rings around the stakes. *Puzzling Pokemon: This game is played like charades: children take turns acting out a Pokemon character for others to guess. Put slips into a hat or box. At game time, have each kid pick a slip of paper and act out their characters, making movements and sounds (but no words). The rest of the group must guess who the player is. *Spoink Race: For this Pokemon party game, you’ll need 3 large boxes and one air-filled balloon per each guest. Divide the players into 2 teams and line them up. Put 1 box in front of each line. About 30 feet away, at an equal distance between teams, place the third large box. When you announce, “Get your pearls!” the first players run to 3rd box, grab a balloon, rub it on their hair to create static, and balance it on their heads as they race back to their teams to fill their empty boxes. If the balloon falls, or they touch the balloon with their hands before reaching their team, the players must start over. The game ends when the third box is empty. The team to finish first (or with the most “pearls”) wins! When several Baltoy are caught in the pen, they must stand with their legs spread out and pretend to cry until rescued. (Baltoy always cries in unison with others of its kind.) To be rescued, one of the free Baltoy-friends has to crawl through the captured player’s legs. Keep playing the game until everyone has been caught, or it’s time to move to the next game. *Shroomish Apple Tree: Children get to act like Shroomish who loves to eat apples. Tie a piece of string securely around each apple stem. Hang them from a furniture fixture, swing set or tree branch. Make sure that apples hang low enough for kids to take bites without using their hands. *Pikachu Stomp: It’s best to play this Pokemon birthday party game outside. You’ll need about 50-60 balloons and Pikachu sticker (or a small theme item). Before blowing up balloons, put a Pikachu sticker in one of them. During the game, the kids have to pop the balloons by stepping on them. A person who finds the sticker wins a prize! *Pass the Pokemon: Play Pokemon birthday party version of classic “Hot Potato” game. Have the kids pass plush Pokemon toy while the music plays. When it stops, the person holding the toy goes out of the game, but receives a prize. The last person remaining in the game wins! *Watch the Show: Let your Pokemon birthday party guests unwind at the end of the party by watching a favorite Pokemon episode. 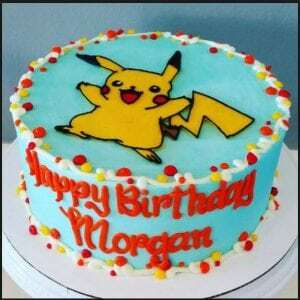 *Pokemon Cake: Bake one or several cakes. Cut and arrange them to make Pikachu shape. (Use Pikachu picture as a guide.) Then frost Pikachu cake yellow. Add facial features, ears, paws, etc. 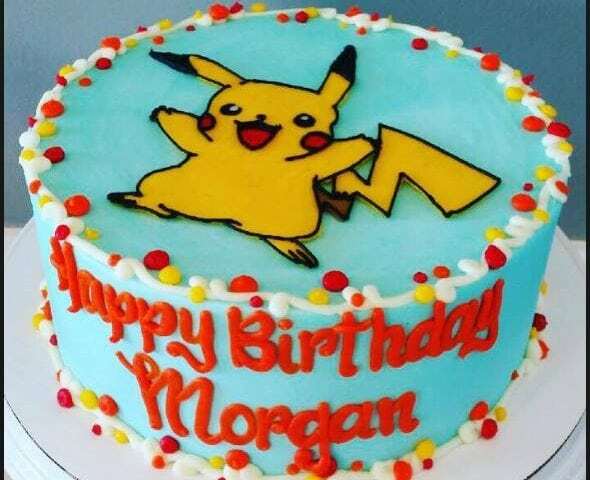 As a variation, you can bake a regular sheet cake, and then decorate it with Pokemon cake toppers (available from a party store). Cut two small ears from yellow construction paper, touch one end of each with a black marker, and insert other end into side of cupcake, near the top of Pikachu’s head. *Whiscash Wraps: For this Pokemon birthday party recipe, you’ll need 8 wheat tortillas, 2 cups granola, 1 cup raisins, 1 cup chopped apples, cheddar cheese slices, natural peanut butter (or cream cheese), yellow pipe cleaners and plastic food wrap. Spread butter or cream cheese on one side of tortillas. Then sprinkle on granola, raisins, apples, and roll up tightly. Then cut cheddar slices in “W” shapes and put one on top of each wrap. Finish by wrapping 1 tip of each pipe cleaner, and curling the other tips slightly. Then insert the wrapped tips of two pipe cleaners into either side of one tortilla wrap, near one end. *Spoink Popcorn Pearls: You’ll need 1/2 cup corn syrup, 1/4 to 1/2 cup water, 1 cup sugar, 1 tsp salt, 1/4 cup butter, 1 tsp vanilla, red or pink food coloring, 10 cups popped popcorn and 2 cups chopped gumdrops. Combine corn syrup, water, sugar, and salt in a saucepan. Cook over medium heat, stirring constantly until sugar dissolves and mixture comes to a strong boil. Remove from heat and whisk in butter and vanilla. Add food coloring slowly to create pink color. In a separate bowl, mix popcorn with chopped gumdrops. Then pour the warm mixture over popcorn and candy, tossing until well coated. Spread on baking sheets. When cool enough to handle, form popcorn balls. Carefully wrap balls in squares of clear or pink cellophane, tie with a bright ribbon, and store in a tightly closed container. *Chimecho Berry Cones: For this Pokemon party recipe, you’ll need 6 cups of berries (strawberries, blueberries, etc. ), 1/4 cup frozen tropical juice concentrate and 3/4 cup cold water. Freeze berries in a single layer on cookie sheets. Mix frozen berries and concentrate with water. Blend in a food processor until nearly smooth. (You may need to divide into portions to process well.) Freeze for a few hours until firm (keeps up to 2 days), or serve immediately. Scoop into cones. Yum! *Starmie Sandwiches: Prepare sandwiches using your child’s favorite fillings. Cut them into star shapes using a cookie cutter. To make Starmie, put 2 star shaped sandwiches on top of each other, then add a square piece of cheese on top and add a piece of small pepperoni on the very top. *Veggies & Dip: Have “Charizard” carrots, “Bulbasaur” broccoli, “Ash’s” apples, “Raichu” ranch dip, etc. *Ice Cream Sundaes: Start with a ‘ball’ of vanilla ice cream. Then top with strawberry, whip cream, coconut, chocolate and nuts. *Torchic Sippers: To make this Pokemon birthday party drink, you’ll need 1 3/4 cups orange juice, 1 cup water, 3 tbsp pasteurized egg white (or egg substitute), 1 tsp vanilla extract, 1/4 cup sugar and 1 1/2 cups ice. Combine all the ingredients (except ice) in a blender at high speed for 30 seconds, or until sugar is dissolved. Add ice and blend until it is mostly crushed. Repeat if necessary. *Pokemon Punch: Fill a large punch bowl with ginger ale or lemon-lime soda. At serving time, add raspberry sherbet and watch it fizz.